Data has become to the Information Age what the steam engine was to the Industrial Revolution; it is defining how products are made and how we solve problems, just as mechanization did in the past. And real life, “voice of the customer”, conversational data is, without doubt, the most valuable kind. 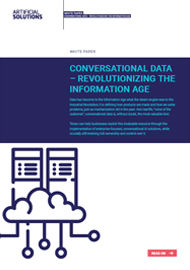 Teneo can help businesses exploit this invaluable resource through the implementation of enterprise-focused, conversational AI solutions, while crucially still retaining full ownership and control over it.